The Pre-Raphaelite Brotherhood was founded in 1848 by a group of English painters: Dante Gabriel Rossetti, John Everett Millais and William Holman Hunt, as well as poets and critics: William Michael Rossetti, an art critic and Dante's younger brother; the art critic Frederic George Stephens; the painter James Collinson; and the sculptor and poet Thomas Woolner. Millais left the group in 1859, but as the second generation Pre-Raphaelites, other English artists joined it, including the painter Edward Coley Burne-Jones; the poet and artist William Morris was never a Pre-Raphaelite in the true conception of the term. The group reacted against the Victorian materialism and the conventions of the Royal Academy in London and was inspired by medieval and early Renaissance painters up to and including the Italian painter Raphael. They found their inspiration at first from the bible, history and poems, but soon the subjects from modern life were also used rooted in realism and truth to nature. Pre-Raphaelite art became distinctive for its blend of archaic, romantic, and moralistic qualities. The Dutch-born Sir Lawrence Alma-Tadema was a great Anglophile, who became one of the best known Victorian Classical Painters, but was never a member of the Pre-Raphaelites. He was knighted on Queen Victoria's 80th birthday in 1899. He painted beautiful people in classical settings, preferable in ancient Egypt and Rome, men and women posing against white marble in dazzling sunlight. Ford Madox Brown was formally never a member of the Brotherhood, but his paintings very much influenced over the Pre-Raphaelites, and he was the most important Pre-Raphaelite painter outside the Brotherhood. Sir Edward Coley Burne-Jones met Rossetti in 1855, became his pupil, and was to become the most important artist of what might be called the second generation Pre-Raphaelites. John Collier began as a pupil of Lawrence Alma-Tadema and became later a fashionable portrait painter. Some of his subjects have a Pre-Raphaelite flavour. came from an artistic family, was one of the later Pre-Raphaelites, painted historical, literary and biblical subjects being very popular and successful in his time. William Holman Hunt is the least known of the Brotherhood even though he was the only one faithful to its principles. His determination kept the Brotherhood together in difficult times. Frederick Lord Leighton was never a member of the Pre-Raphaelites, yet was he friends with many of them, and there was close link between his Aesthetic Classicism (Victorian Classical painting) and the Pre-Raphaelite style. Sidney Meteyard was a member of the second generation Pre-Raphaelites and the follower of Burne-Jones. Meteyard belonged to the Birmingham school of painters, from which group many interesting Pre-Raphaelite artists came from 1890 to 1920. Sir John Everett Millais was the most talented artist of the Brotherhood and his first public achievements were the Silver Medal at the Society of Arts when he was only nine and a medal for drawing from the antique at the Royal Academy of Arts at the age of 14. His life was one long success story and he was the only member of the Pre-Raphaelites to abandon later its principles completely. William Morris, a poet, designer, and later a socialist who urged a return to medieval traditions of design, craftsmanship, and community. He was the prime figure in the formation of the Arts and Crafts Movement. Sir Edward John Poynter was never a member of Pre-Raphaelites, instead he was one of the Victorian Classicist painters (the so-called Olympians) together with Leighton, Alma-Tadema and Watts. However, Poynter used some Pre-Raphaelite ideas in paintings as well as book illustrations. Mrs. Poynter and Mrs. Burne-Jones were sisters. Dante Gabriel Rossetti was the man behind the Pre-Raphaelite Movement. Ford Madox Brown took this talented young man in 1848 as his pupil. This started their lifelong friendship, out of which the Pre-Raphaelite Brotherhood was born. Rossetti was the 'poetic inspiration' behind the group who, besides being a painter, designed stained glass windows, made book illustrations, and translated poetry from Italian into English. Anthony Frederick Sandys was one of the most devoted pupils of Rossetti. Like Rossetti, most of his paintings were of beautiful women, but he also got an enormous reputation as an illustrator of books and magazines, who treated each illustration as a major artwork. Simeon Solomon (1840-1905) had a special interest in Jewish history and ritual, was befriended by Rossetti and Burne-Jones, who both influenced his early works. 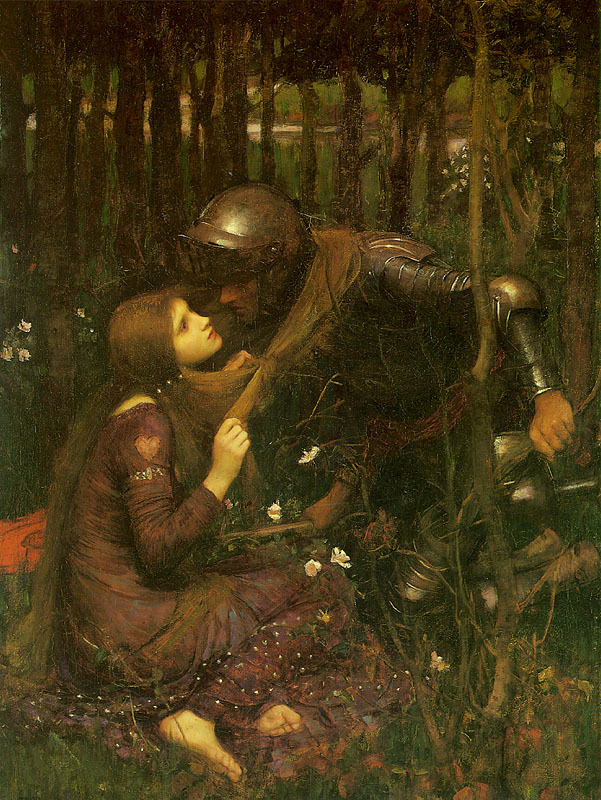 John William Waterhouse was born in 1849, a year after the Pre-Raphaelite Brotherhood was founded. He style was very individual fusion of classicism and the Pre-Raphaelitism, and also he was dedicated to beautiful girls in the Pre-Raphaelite style, fondness for the idea of the femme fatale, and realism. George Frederick Watts knew most of the Pre-Raphaelites, but was part of no School or group. He was almost like a father-figure for Burne-Jones and was an important influence on the younger ones. Being a great admirer of the Venetian School he produced mainly allegorical pictures of great strength and mystery. Thomas Woolner, the sculptor, was one of the founders of the Pre-Raphaelite Brotherhood, spent six years in Australia, and later did sculptures of many intellectuals, poets and scientist. 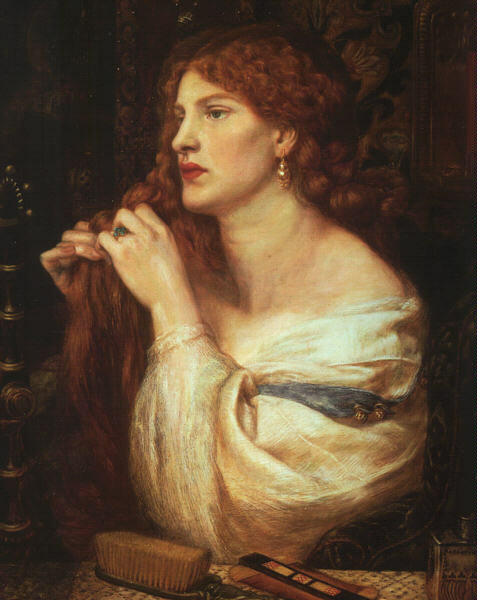 Fanny Cornforth, was Rossetti's large and vulgar model and mistress, who shared many years of his later life as his companion and housekeeper. Annie Miller was a beautiful barmaid, and the red-haired femme fatale of Hunt, who tried to transform her Pygmalion-like and even marry her, but ended in failure. Evelyn de Morgan (born Pickering) married William de Morgan, the famous potter. Her subjects were poetic and allegorical, her work was much influenced by Burne-Jones and she is one of the very few Pre-Raphaelite artists whose work can be described as Symbolist. Jane Burden Morris married William Morris unhappily, and became the favourite model of Rossetti who has inmortalized her in many of his famous paintings. Rossetti had a long-time obsessive love affair with Jane whose beautiful features are so well known to all Pre-Raphaelite enthusiasts of today. Elizabeth Siddall (Rossetti) was an apprentice milliner, whom Rossetti found as a model and drew her constantly. After a long relationship Rossetti finally married "Lizzie" in 1860, but the marriage was an unhappy one and she died to an overdose of laudanum in 1862. Marie Stillman (born Spartali) the daughter of a Greek family living in London, was a famous beauty and a pupil of Ford Madox Brown. Her own paintings of allegorical female figures show the influence of Rossetti, for whom she also modelled ("Bower Meadow"). She married an American journalist William J. Stillman. Maria Zambaco (born Casavetti) was a beautiful Greek sculptress who was romantically involved with Burne-Jones, and appeared in many of his pictures in 1868-71.